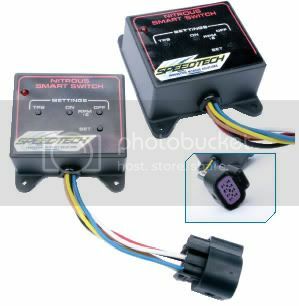 Speedtech’s new fly by wire nitrous controller was designed from the ground up for the specific task of giving the late model fuel injected nitrous owners the easiest and most reliable way of activating their nitrous system. The control unit is extremely easy to program and allows the user to choose which throttle position, minimum RPM, and maximum RPM will activate their nitrous system. It also includes an interrupt circuit for cars utilizing a clutch and two step or a trans brake.